Have you ever wondered why you crave certain foods, even when you’re not hungry? We all have our food memories, some good and some bad. The taste, smell, and texture of food can be extraordinarily evocative, bringing back memories not just of eating food itself but also of place and setting. Our chosen comfort food is almost always the kind of dishes we grew up with. Can you guys guess what I'm craving for??? Absolutely!!! Right now I'm Craving for a big plate of aromatic coconut rice topped with sweet and spicy sambal chilli, a juicy deep-fried chicken wing / fried fish,fried eggs ,fried peanuts and crispy ikan bilis? I'm crazy about these local cuisine of mine. Frankly without guilty conscience I grow up eating them for breakfast ,lunch even dinner . 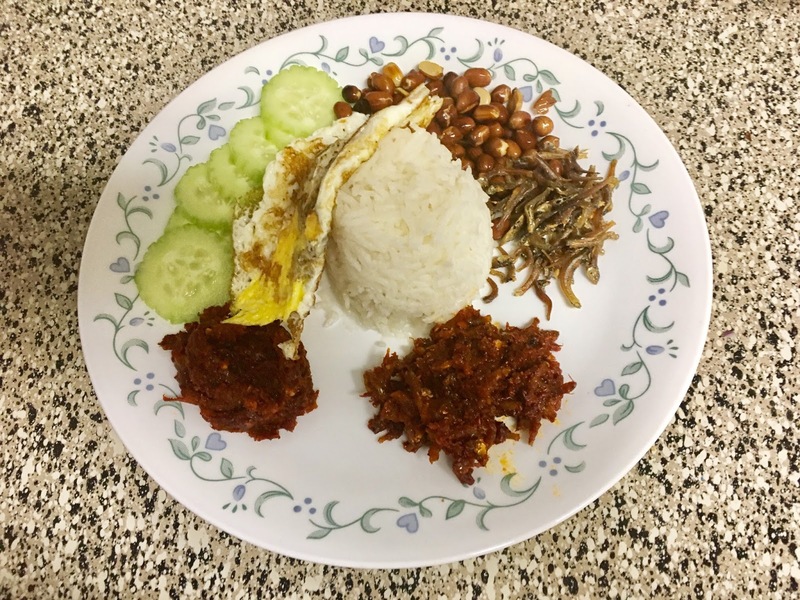 Throughout my school years, I would savor nasi lemak, wrapped in green banana leaves, at least three times a week. 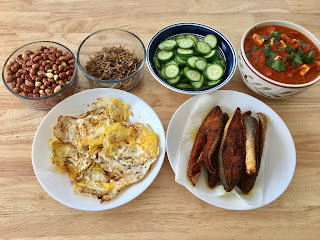 Inside the bundle was warm coconut rice infused with the vanilla-like aroma of pandan leaves accompanied by a fried egg, crispy fried anchovies and peanuts, a few slices of cucumber, and a dollop of sambal — flavors that are still etched in my mind. Most of my childhood is stored not in photos, but in certain smells and places … Nasi Lemak is one of Singaporeans’ favorite dishes, and I grew up having this, hence my particular fondness for this indulgent plate of rice. While there are so many foods that have power to arouse happiness, Malaysian nasi lemak takes satisfaction to the next level. 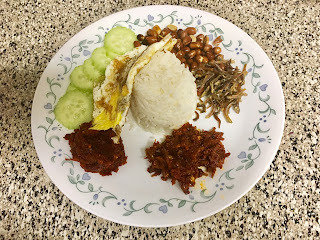 Nasi lemak is a Malaysian fragrant rice dish cooked in coconut milk and panda leaves. 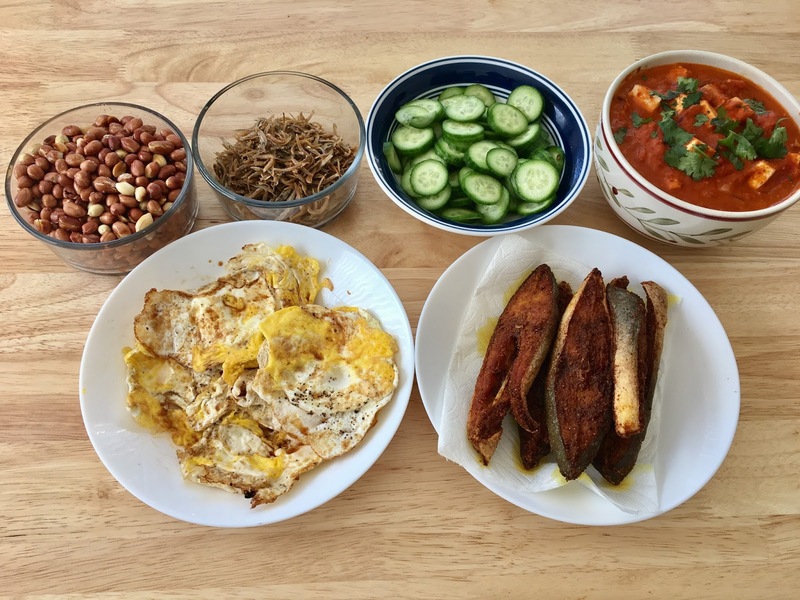 It is commonly found in Malaysia where it is considered the national dish it is also popular in neighboring areas such as Singapore .This traditional favorite offers sambal, ikan bilis(anchovies), peanuts and boiled egg. The rice can be cooked with fresh coconut water, and then the cooked rice will be wrapped with pandan leaf to serve. Since all the side condiments can be served at room temperature, they can be made well in advance. I always prepare more than I need at one time so I can enjoy this dish again whenever I want. The fried peanuts and anchovies,can be fried and then stored in an airtight container at room temperature. 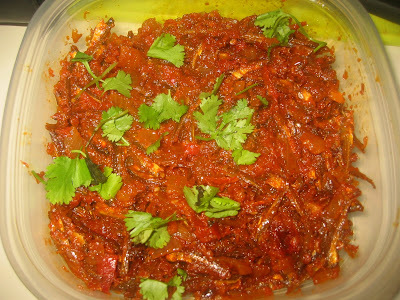 The sambal can be stored in the refrigerator or freezer and then microwaved when you need it. When all of the main preparations are done ahead of time, you are only left with cooking the coconut rice, which should be served piping hot along with warm hard-boiled eggs and fresh slices of cucumber. 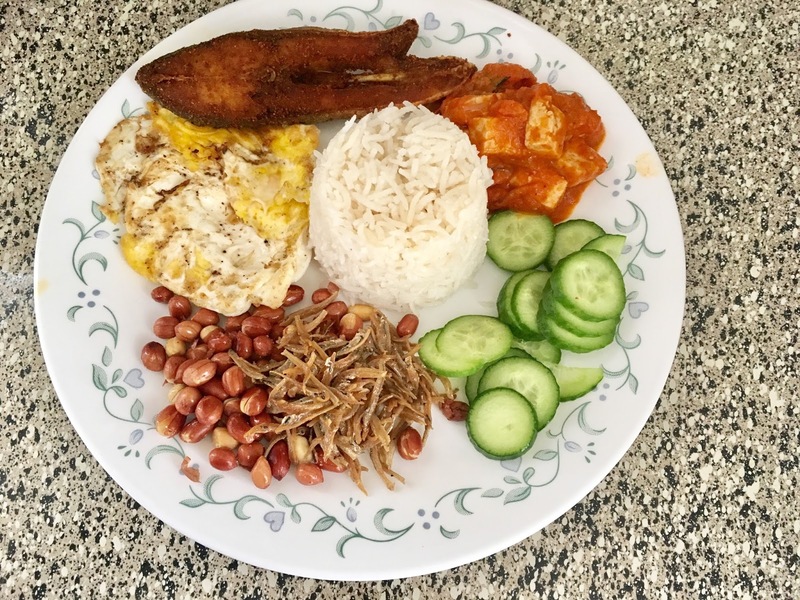 Think you can’t cook Malaysian food? Too complicated? Wouldn’t know where to start? Think again! First rinse the rice and drained it well. Place the drained rice in a rice cooker. Pour 50ml (1/4) of the thick coconut milk into a measuring cup. Add a little of the water to dilute it a little. Add in salt and sugar and stir to mix. Pour the coconut milk mixture into the drained rice in the rice cooker. Add in the rest of the water. Lastly add in crushed ginger, lemongrass and Pandan leaves. Cook the rice. When the rice reaches warming stage, remove the herbs and spices and add in the rest of the thick coconut milk. Stir into the rice. Close the lid and let the rice absorb coconut milk. Rinse the dried anchovies and drain the water. Fry the anchovies until they turn light brown and put aside. Pound the prawn paste together with shallots, garlic, and deseeded dried chilies with a mortar and pestle. Slice the onion thinly. Soak the tamarind pulp in water for 15 minutes. Squeeze the tamarind constantly to extract the flavor into the water. Drain the pulp and save the tamarind juice.Heat some oil in a pan and fry the spice paste until fragrant. Add in the sliced onions. Add in the ikan bilis and stir well. Add tamarind juice, salt, and sugar. Simmer on low heat until the gravy thickens. Set aside. Apply salt to fish and rinse it well. Drain thoroughly. Mix all the ingredients except oil. Apply to the fish. Keep this aside for 10 minutes. It absorbs flavors well. Heat a small pan with oil or ghee. When the oil turns hot enough fry it for about 3 to 4 minutes. Then flip it to the other side. Fry again till it is fully cooked. Combine all sambal paste ingredients in a blender and blend until fairly smooth. Heat chili oil in a heavy bottom, non-stick pan, add cubed tofu and stir fry until lightly golden on all sides. Spoon out and set aside. Heat cooking oil the same pan and add Sambal paste - Stir fry the sambal for a few minutes until fragrant. Add the prepared tofu and continue to stir fry for another 2 minutes. Add the tamarind mix. Add sugar and taste test to make sure that it is seasoned appropriately. The sauce should be very spicy with a balancing undertone of sweetness and saltiness. Remove from heat. Place a small non-stick frying pan over the lowest possible heat on your stove. Add the butter and let it melt slowly. then crack the egg into a small bowl and gently slide off the bowl into the frying pan -cover with a lid.Cook for 10 minutes. Flip over if you or else slide the cooked egg onto the serving platter sprinkle with fresh cracked pepper and salt. Rinse the peanuts and drain. Add peanuts along with the oil to a pan, turn on heat up to medium-low. Shake your pan from time to time. After 4-5 minutes, there will be “pa” sound in the pan. Turn off the heat and shake the pan for another minute. Transfer out and filter any oil. Sprinkle the salt and mix well - keep side. To finish of the plate slice some fresh cucumbers and arrange the your plate of Nasi Lemak. Enjoy!! !